Call Centre workers only actually work 42% of the time!! Well that is not exactly true but it has got your attention, right? What is true is in our UK based benchmarking in the last 12mths only 42% of an agent’s time is actually spent doing what we really want them to be doing, talking to customers!! Often a subject that generates lots of discussion, shrinkage is the reason for a massive 58% of an agent’s time that’s not being spent on the phone talking to customers. Shrinkage is ultimately the amount of time when agents are being paid to be on the phone but are not actually working or available to receive calls. So what does Shrinkage tell us? Well from a resourcing perspective it helps to have a good grasp on what your organisations shrinkage is and what levers you can pull in order to help manage your resource levels and still meet customers’ needs. It can also be used politically to help explain your FTE and resourcing requirements to stakeholders who don’t have a day-to-day understanding of contact centres. 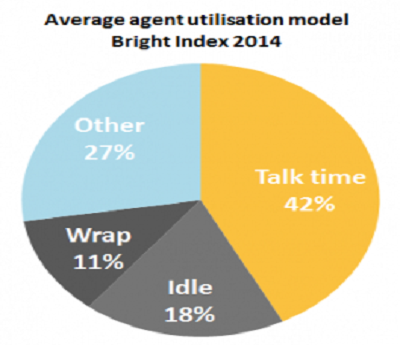 Just because only 42% of an agent’s paid time is spent talking to customer doesn’t mean we can sack the other 58%!! ‘Other’ impacts resourcing with a huge 27% on average, but there a multitude of factors that influence this: holiday, training, meetings, absenteeism to name but a few. If it isn’t talk-time, idle time (available time) and wrap time (ACW) then it falls into the ‘other’ segment. What is good news is that the vast majority of the factors that feed into shrinkage can be influenced and tweaked to help drive more efficiencies at the same time considering employee engagement needs. A metric such as wrap time can be impacted by the systems and processes agents have to adhere to but also you could consider how effectively is it managed? Are poor agent behaviours challenged? The same could be said about absenteeism, are high levels of absence just accepted as the norm? Or is there an effective absence management policy in place? There is a however a danger that operational managers will choose to pull the ‘easier levers’ in order to help minimise the impact of shrinkage. Cancelling meetings, training and 1-2-1’s will add extra resource for a short space of time, but what impact will this have on employee engagement if this happens on a regular basis? Overtime will alleviate the strains of excess call demands but a more effective resource model, fit for purpose shift patterns and effective work force management would offer a more suitable long term solution. A large number of contact centres under-estimate shrinkage levels, by not taking into account hidden areas of shrinkage including lateness, talking to associates, personal calls, leaving early and longer breaks etc. It is also fair to say that operations that effectively use work force management solutions manage the strains of shrinkage more effectively. Shrinkage is a major factor for contact centres not achieving desired service level and meeting customers’ expectations. If all shrinkage factors are monitored, managed, and taken into account when forecasting and scheduling, then you can achieve higher service levels at lower operating costs. Copyright © 2019 right UK Limited. All rights reserved.